Hindu Samhati held it's Core Committee Meeting near the Kolkata airport over December 29-30 weekend. Over a hundred HS senior activists attended and participated in this yearly meeting. Acharaya Dharmendaji Maharaj was a special guest at this meeting. He delivered a powerful speech that inspired the workers. Acharya-ji congratulated Tapan Ghosh and the entire team of Hindu Samhati for building this powerful organization in Bengal. Hindu Samhati has been approached by residents in Orgram to help them block attempts by a Muslim group to take over a girls' school (balika vidyalaya). The one acre land that the school is situated on, was donated by Dr Nandalal Ray, a local philanthropist. The school was built over a period, and then ran succesfully for over 18 years, with local private funds donated by the residents. The institution temporarily shut down two years ago, the government delayed state recognition of the school, and there was a funds crunch. 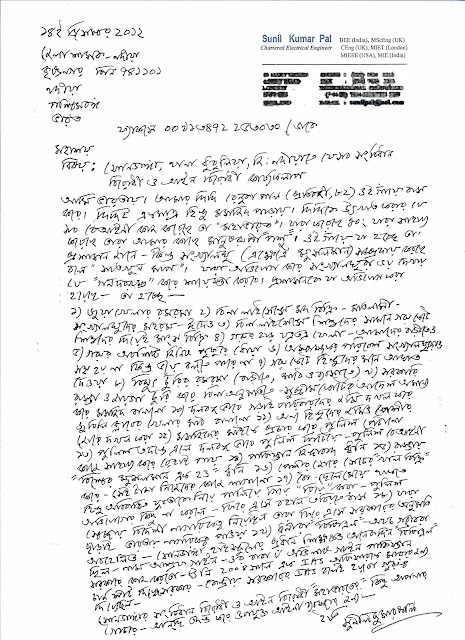 A letter to the district magistrate of Nadia, from Sunil Pal. His struggle to save his family and his property from takeover by Islamists was presented in a prevous article titled - The Making of Another East Pakistan in Nadia District , A NRI 's journey to his village. Trade of fake notes is rampant in Maldah at the moment; success of police to have fake notes worth Rs. 11 lakh (1 lakh = 100,000) owing to nightlong investigations (on December 11 and 12, 2012) in Vaishnabnagar and Kaliachak in the district and arrest of four Muslims in this context have revealed the dirty secrets predominating this bordering district of Bengal for decades. Maldah happens to be a stronghold for illegal Muslim infiltrators from Bangladesh to India for decades and trade of fake Indian currency helps them to ensure their safety in India immensely – the dirty secret. Without exception, festivities like the Durga Puja, Kali Puja, Bakri-Id, Jagaddhatri Puja, all have witnessed regular clashes between the Hindu and Muslim communities across Bengal and the Hindu Samhati office has received regular intimation of many such cases. The incidents at Entally and Tehatta were of somewhat larger magnitude. 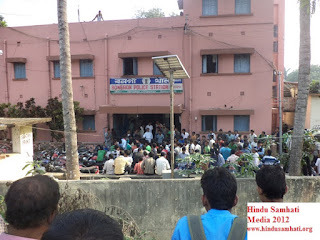 In Tehatta, 26 odd Jagaddhatri Puja festivals were stopped and one person belonging to the Hindu community had to pay with his life from police firings. On the other hand in Entally, the deities of goddess Durga were broken and some ten Hindus were arrested for fifteen days. 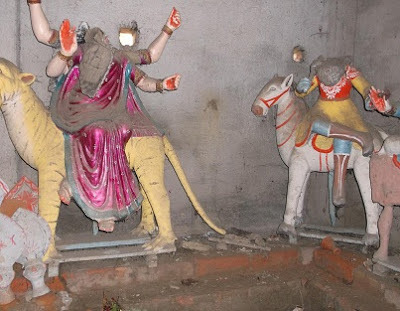 Copious idols were stealthily destroyed in Beleghata, Kolkata and Shantipur, Nadia district too. The total number of such cases has been too many to keep proper records. Importantly, in many places there have been reports of resistance from the Hindus in response. It is utterly futile to reiterate that the reigning Government of Bengal is most interested to better a single community – Muslim – in the state than any other and the same trend has been going since its induction into the governance almost two years back. And this stance does not bring forth any other notion except blatant appeasement or pseudo-secularism, the same saga has been going on unchecked and the latest addition to the same happens to be the (newest) diktat of Ministry of Minority Affairs, Government of India to spend Rs. 10 crores for development in any Block in Bengal inhabited by 20% of minority people. With this end in view a meeting took place between officers of Ministry of Minority Affairs, Government of India and Ministry of Minority Affairs, Government of Bengal recently. The high-profile meeting was also attended by District Magistrates of 11 districts across Bengal. First I congratulate the youths of Delhi for demonstrating their iron will to protest against the heinous crime and expressing their distrust towards the system we have. However, this expression of anger lacks articulation of the root cause. And this proves the absence of any established group in this spontaneous protest, further demonstrating disconnect between the people and parties. The govt. and the political parties are happy enough that these unorganized and inexperienced youths cannot pin point and focus the actual loop holes in our system which are always used by the political beasts. Will Police Culprits be Penalized? The name of Dipu Das (age 42), Hindu individual and rickshaw puller by profession, is not known to a lot of persons. However, the same innocent man, belonging to Hindu (Mahadalit Ravidas)community, who was the main source of living for his family simultaneously, succumbed to death on December 2, 2012 at 3.50 PM owing to serious injuries. Outrage In Baruipur : Will The South 24 Parganas Administration Wake Up Before Its Too Late ? Again the glaring appeasement of Muslims by the govt. of West Bengal has come to the fore, this time in the Sardarpara locality of Baruipur, S. 24 Parganas. Here, the Muslims of the wider area are trying to build a mosque, firstly on govt. land and secondly, right inside a Hindu locality and opposite a temple. Despite mass petitions of the local Hindus, the govt. has decided to keep its eyes closed. All for the sake of Muslim votes. The administration’s abject surrender to all the misdeeds and illegal demands of the Muslims compels the Hindus to think that they cannot expect even a shred of justice from the govt. In consequence, Hindus will be compelled to think of migrating from this area of S. 24 Pargana district. Another Mograhat is in the offing, where Hindu percentage came down from 87 % to 47 % between 1981 and 2001. Wars are not won by enormous martial spirit, provision only but by fortitude also – Gopal Chakraborty (age 75) inhabiting village: Bankra, P.S. Hingalgunj, District: 24 Paraganas (North) is fighting a lone battle for years with the same form of determination. The aged Hindu person is trying best to save his land from the clutches of neighboring Islamists desirous ever to build a mosque there. What is more striking Gopal Chakraborty has the legal sanctions in this regard but Islamists are leaving no stone unturned to make their nefarious design a great success and their approaches are being strengthened by secularist parties. Influence of Muslim Vote Bank and Cow Smuggling Money Make Hindus Helpless in This Border Town On 11 December 2012, at around 07:30 PM IST, Koyel Roy (daughter of Late Sankar Roy) who is a student of class VII was returning from her private tuition. At Debgarh, she encountered with Shafikul Mollah, who is a cow seller (dalal) of Sundargarh, Shafikul was in a Maruti car along with his few friends and was completely drunk. They tried to drag Koyel inside the car. But Koyel, somehow, escaped from them and entered into a nearby house where a marriage ceremony was being taken placed. Desecration of Hindu deities by Islamists in the realm of Bengal is not a new phenomenon any more; it’s unabated virtually and the steadfast indifference of police and administration in the state to the same reinforces Islamists’ confidence all in all. Village: Chunapukur No. 2 in Gordeyani area, P.S. Joynagar, Block: Joynagar, District: 24 Paraganas (South) bears testimony to the same. On November 26, 2012, around 12 am, the immersion program of Goddess Jagaddhatri in the village was in full swing. While returning from the holy immersion, around 1.30 am, Hindu villagers were shocked to perceive that heads of holy Hindu deities at Sarvadevdevir Than had already been chopped off. The situation was enough to anger Hindus in the environs and the news of defilement spread like a wild fire. Each and every repression strengthens fortitude of the warrior and Hindu Samhati, experienced lots of such adversities over the years (ever since its inception), is all set to observe its 5 th anniversary on February 14, 2013 with splendor (surpassing the preceding years). The reigning government, its Chief Minister Mamata Banejee in particular, to pacify Islamists, made desperate efforts to subdue Hindu Samhati’s anniversary on February 14, 2012 but had to suffer a crushing defeat owing to indomitable zeal of Hindu Samhati activists. The historic struggle, during February 14, 2012, ushered a new hope among Hindus in Bengal and stimulated Hindu Samhati activists as well. This can be found from the stupendous rise in Hindu defences against Islamic persecutions – the struggle is in full swing and is intensifying with each day it passes. Islamic fundamentalism had been imported to Bangladesh from Saudi Arabia by the followers of Wahabism around two hundred years ago. During the British colonial period, the Wahabis led by one Syed Ahmed declared India 'Darul Harb' and locked themselves in a war against the Shikhs in Punjab and against the British everywhere else in a bid to establish the 'Darul Harb' brand of Islam. Theologically speaking, their views about Islam were utterly timeworn and conservative. Shondanga is a lush-green village under PS Dhubulia, in Nadia District, West Bengal. It is just 7 km away from Mayapur (the headquarters of ISKCON), 2 km from National Highway number 34, and about 11 km from Sadar Krishnanagar (administrative headquarters of Nadia district). The week after Durga Puja, a team of Hindu Samhati activists led by Sri. Tapan Ghosh, Sri. Dipak Sanyal and Sri. Somraj Ganguly visited Shondanga to assess the situation and offer strength and support to the beleaguered Hindus of this village, who are experiencing the brazen creation of another East Pakistan by alien Muslims who hold East Pakistani nationality, while the authorities continue to live in denial and nonchalantly look the other way. Islamists are gaining a strong foothold in the political scenario of Bengal, thanks to secularists and their lasting aficionados – there is little doubt in this case but how far they have progressed by now can be gauged only if one goes through the Islamic assemblage occurring on December 6, 2012 at Rani Rashmani Road, Kolkata to protest against both United States of America and Israel. The public meeting for Muslims exclusively was convened by Jamiat Ulama-e-Hind under the aegis of General Secretary of its Bengal unit, Siddiqullah Chowdhury. The meeting was attended by a crowd comprising almost 20,000 Muslims. ................... .................Siddiqullah Chowdhury has recently joined the virulently Islamist political institution AUDF of Badruddin Ajmal. 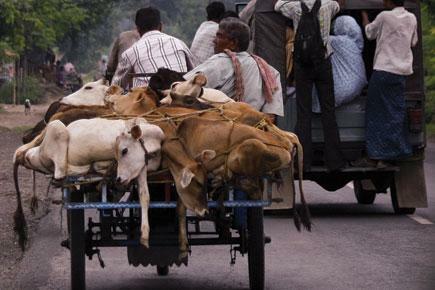 Muslim Cow Smugglers Bribe Police in Bangaon Regularly! Whatever might be steady defects of Bengal governance in the past, it was vital at least – a saga that is becoming rarer now with each day it passes. And the present situation is so pathetic that even a petty Muslim cow smuggler can threaten the administration! Following the death of four Muslim cow smugglers at Bangaon-Chakdaha road in Sialdanga area, P.S. 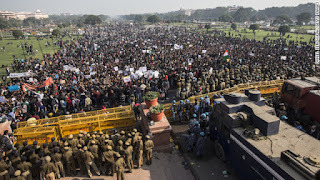 Gopalnagar, Distirct: 24 Paraganas (South) on November 24, 2012, the whole area with its vicinity entered into the caldron of fire where Muslim cow smugglers blocked roads and railways paralyzing the administration virtually for hours. When police went to negotiate (and if necessary to dismantle it) with the local bosses of Islamists, there was a large outcry for vengeance. Even some of them were heard to scream that the business of cow smuggling was going on in full cognizance of police and as they had to pay government officials hefty amounts regularly, death of their co-religionists was unacceptable to them. 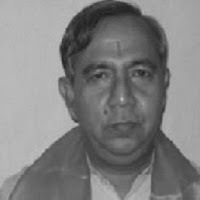 NEVER – the dream of Hindus to establish own identity will come to an end; NEVER – the vitality of Hindus to fight for Justice will cease to exist. This was the fundamental principle that stimulated millions of Hindus in the late 80s and early 90s to be a part of the historic Ram Janmabhoomi Liberation Movement leading to the demolition of Babri Masjid. The demonic structure was built in 1528 by Mir Banki Khan, one of premier generals of Zahir-ud-din Muhammad Babur Beg or Babur, a foreign invader and founder of satanic Mughal dynasty in India, by destructing a pre-historic temple built to mark the birthplace of Sri Ramchandra. More than 150 activists of Hindu Samhati gathered in Uluberia (PS Uluberia, District: Howrah) to hold a workers' training meeting. The program had several eminent speakers, among them Tapan Ghosh, Bikarna Nashkar, and Kanti Ranjan Samanta. In Bethan village, a Durga Puja is organized each year by tribals / locals comprised of Mahato and Rajbonshis. The puja is the main celebration of this group in the village annually, in this northern district of West Bengal. 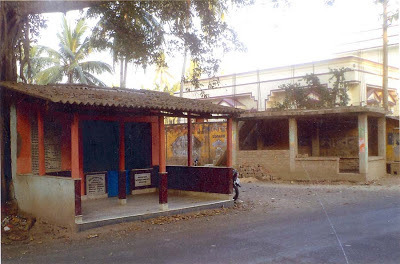 On 19th October 2012 (Panchami-5th day of Puja), the committee was approached by a grieving truck driver, who said that he was victimized by this Muslim gang 2 kms away from this area. He claimed he was looted by them, asked the organizers for assistance in remediating this nuisance (looting, etc) by approaching the adminstration. It was November 22, 2007 and now, when this report is being written – December 7, 2012 – lots of changes have taken place by now except one – Taslima Nasrin, globally acclaimed woman author, expelled forcefully by Islamists from Kolkata on November 22, 2007, is yet to return to the metropolis. On November 22, 2012, a press conference was convened by the group Women Against Oppression (WOA) at the Calcutta Press Club. The speakers came out as unanimous in decrying the blatant surrender of alleged secularists to Islamic fundamentalists and zealots who have been leaving no stone unturned to hinder the return of Taslima into Kolkata. 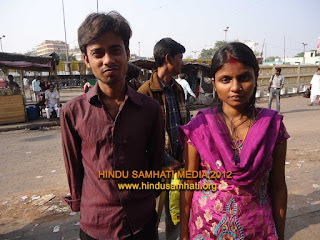 Dipankar Roy, 22 years old (Hindu) was brutally murdered as he had married Salima (Muslim). Both of them had been in love for a while. The victim was riding his motorbike coming back from Chandpara to his own house, when he was lynched and shot dead by Muslim activists led by Aamir Mandal, a member of the local Islamist organization. Dipankar's body was found in a pool of blood and bore multiple bullet wounds in the chest, abdomen and shoulders. But West Bengal police has not bothered to arrest the murderers, as there is intense pressure from the local Muslim religious bodies. Instead, the police is trying to shield the perpetrators. District: North 24 Parganas. Subdivision: Bongaon. Near the Bangladesh border. To See The Full Pictorial, please visit the South Bengal Herald link given below. 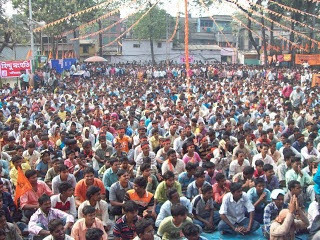 On 25th November, 2012, more than 1,500 Hindu activists and supporters converged in Thakurnagar (near Bongaon) in North 24 Parganas district of West Bengal to raise issues faced by them in the local area (as well as all of West Bengal). 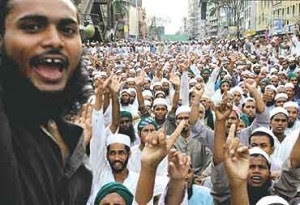 1--Illegal Mass Infiltration by Bangladeshi Muslims, including large numbers of trained Islamist Jihadis, in a planned way to demographically alter and therefore capture West Bengal (mostly Hindu). 2--Raising of Public Awareness of the Grand-Scale Stealing and Illegal Trafficking of cows (over 10,000 cows are trafficked illegally on a daily basis from the Bongaon border alone) by the Muslim business-goonda-clergy nexus, which include both Bangladeshi and local West Bengali Muslim elements, along with some corrupted government officials. If Hindus get aggrieved witnessing the sequential acts of blasphemy (cow slaughtering) to their Dharma, resist it strongly and make Islamists stop their vicious (apparently anti-Hindu) acts, Muslims have the prerogative to thrash Hindus severely while the administration remains a mute spectator to it. This latest version of secularism is engulfing the whole of Bengal like a wild fire and Hindus are getting compelled to surrender to it. 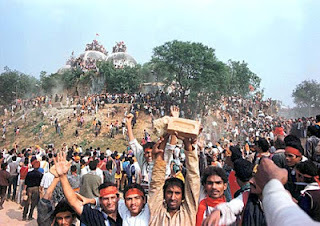 Only if Hindus can subdue these initial disasters and march on victoriously, Hindu destiny can change in effect. Any other expectation equates to building a castle in the air. Village: Choto Mohora, P.S. : Amta, District: Howrah in the Indian state of Bengal is known for its courageous acts in the vicinity for years – its triumph in making Islamists stop cow slaughtering. [To Know More Please See: http://southbengalherald.blogspot.in/2011/01/defiant-hindu-resistance-stops-cow.html].